This post is part of the #blogelul project started by the inimitable Ima On (and off) the Bima. I am using it as my motivation to rejuvenate this site and get myself back into the swing of things. There were other services before it – Lycos, Go, and WWW Worm, to name a few – but AltaVista was the my first go-to solution to find the obscure, the hidden, the I bet-it-won’t-have-this. I remember the amazement at what it (and all the other tools that came after – Excite, Yahoo, Dogpile, AskJeeves, and of course Google) could find, and how easily answers were obtained. But like so many advances in technology, once the novelty wears off, the amazement fades quickly and turns to indifference. I’m left wondering if, as comfortable as we have all become with the concept of searching, and how we all take intuitively understand the power of a well-phrased search query, whether we’ve simultaneously lost the ability (or at least the will) to really search if it involves something other than a screen. 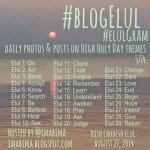 In Hebrew, the word Elul means “harvest”. In Aramaic, it shares the root of the verb “to search”. During this month, our inward-focused searching should increase. We should endeavor to seek out those dark corners of our soul, and address what we find there without fear or shame. And on Rosh Hashana, we should gather everything we find together and be prepared to present the fruits of our seeking to the One who sees us completely.